strengthMuscle strength and power that takes place in Throws, that is, helps you develop both brute force compared with other physical activities or sports. EnduranceCardiovascular endurance constantly providing Throws practice, that is, how much help you cope ejercitándote long compared to other sports or physical activities. AgilityAbility to move the body as desired quickly and accurately obtained by practicing Throws, constantly compared to other physical activities or sports. ReflexesAutomatic responsiveness to stimuli is achieved spontaneous Throws, practice compared to other sport or physical activity. AccuracyHow much will dominate specific body movements to achieve the same result to practice Throws, compared to other sports or physical activities. BalanceBoth are able to control the body's muscles to prevent the imbalance by making Throws unlike other sports or physical activities. ConcentrationThe ability to focus mind and senses intention to achieve a specific goal that is acquired by practicing Throws, compared to other sports or physical activities. 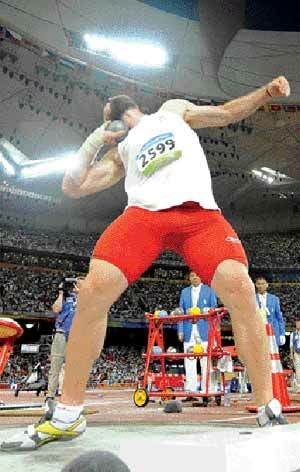 ToningStylization of the body and muscle derarrollo pruduct of optimal levels of body fat that comes from Throws, compared to other sports. Calorie BurningThat many calories are burned while practicing Throws, when compared to other sports or physical activities. 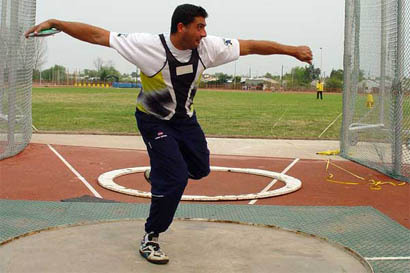 There are 4 throwing events: disc, hammer, javelin and shot put, these are performed in the track area. The Olympics is where it meets the world's best in these sports. At the Olympic Games of ancient Greece and the panhellenic games, launches were part of these. It is known that about three thousand years ago, to the 776 BC in Olympia in ancient Greece, athletes gathered from different regions to compete in different sports at the time. The best performance was expected from the athletes for the pride of his hometown, in return they were proclaimed as heroes, placing them a crown of olive branches, cut with a special knife for a 12 years whose parents should have been alive like condition. The winners on arrival, passed through a hole made in the wall of his city to be closed after they have passed to prevent the success escape from the city, they also offer their trophy to the god Zeus. Do not step on the marked areas for each of the releases, will cause the release is canceled. Appear on time to registration. For each launch is marked an area where each of the objects thrown must fall, if it falls out of them, shoots are canceled. Installation for launching disc with throwing circle (2.50 m. in diameter), protective cage and landing sector (80 m. radius, 54.72 m. of rope). Installation for the Hammer Throw with throwing circle (2.135 m. in diameter), protective cage and landing sector (90 m. radio, 61.56 m. of rope). Installation for launching the javelin with corridor (30 m. to 36.50 m. x 4 m.) arc with a radius of 8 m. and landing sector (100 m. radio, 50.00 m. of rope). Installation for the shot put with throwing circle (2.135 m. in diameter), container (1.22 m.) and landing sector (25 m. radio, 17.10 m. of rope). It consists of a metal ball attached to a handle by a steel cable, the winner is whoever sends it further, the launch is made from a circle of 2.14 meters in diameter. The entire weight of the hammer must be at least 7.260 kg and a maximum of 7.285 kg in the men and a minimum of 4 kg and a maximum of 4.025 kg in the female category. The disc is launched from a circle of 2.50 m in diameter and must land within a sector angle of 34 ° 92 '. The weight of the disk is 2 kg for males and 1 kg for females, has a diameter of 219 to 221 mm and a width of 44-46 mm in the male, while the female has a diameter of 180 to 182 mm and a width of 37 to 39 mm. 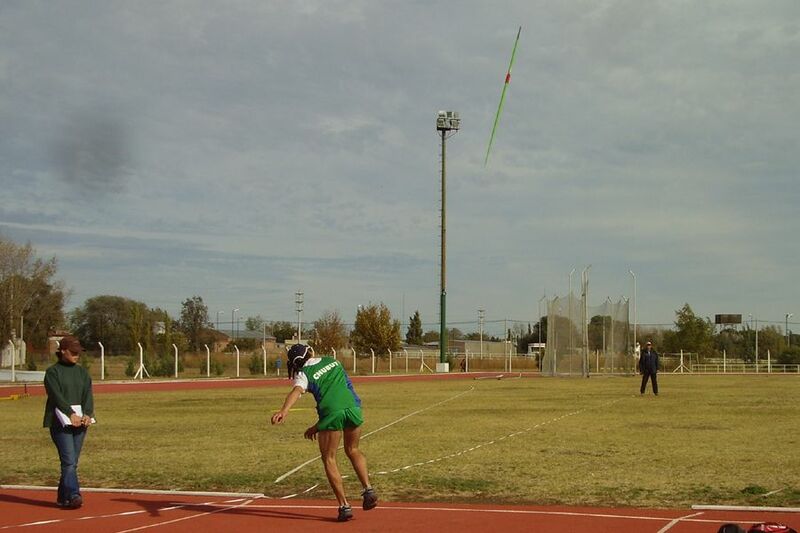 Consists of launching a javelin made of metal or fiberglass as far as possible, each athlete performs 3 shots. 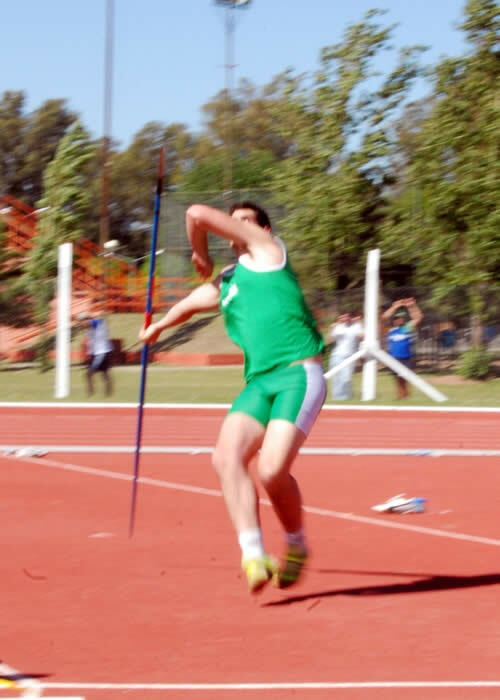 The length of the javelin is 260-270 cm in the male category and 220-230 cm in the female category, and has a maximum weight of 800 g for men and 600 g for women. 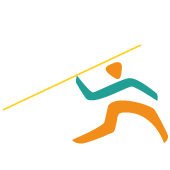 The javelin must hold by the grip or at least the athlete's hand should touch her. The weight of a shot is 7 kg 260gms for men and 4 kg in women, the weight can change according to age of the participants, the launch area is marked by a circle of 2.137 m (7 feet) in diameter.